he looked a bit younger than before. What does this all mean? The Zetas explain. Russian President Vladimir Putin fired 15 Russian generals as the country prepares to launch its biggest war games in over four decades. Russia is to hold its biggest military maneuvers since the height of the Cold War next month, mobilizing about 300,000 troops and including the participation of thousands of soldiers from China. The Vostok-2018 exercises in Russia’s eastern and central military districts -- spanning from the Ural Mountains to the Pacific coast -- from Sept. 11-15 will involve almost a third of the country’s soldiers. 20 percent of Russia’s State Duma, the Russian legislative body, simultaneously act as lobbyists for the military and other law enforcement. Many lawmakers also have deep connections to the Russian intelligence services and interior ministry. Firefighters arrived at 12 Neglinnaya Street, where a fire broke out in the administrative building on the fifth floor. The fire started at around 8:30 p.m. Moscow time (1730 GMT) and it was extinguished within half an hour. August 24 in the building of the Central Bank on Neglinnoye there was a very strange fire, if not suspicious. In the traditional Friday "short working day", on the eve of the weekend, on Neglinnaya after 20:00 there were both Nabiullina herself and her two first deputies: Dmitry Tulin, and Sergey Shvetsov. It is noteworthy that the main event of the day - the meeting of the Board of Directors of the Central Bank, which was preceded by a long and tense preparation, was supposed to end in the first half of the day. Usually, after it, the Central Bank's tops try to take a break and leave work early. But this time Nabiullina and her deputies for some reason were late. The Russian president and prime minister remain in close contact during the latter’s absence from public events, a Kremlin spokesperson said after the government press service revealed Dmitry Medvedev had suffered a sports injury. under Bush were finally dismissed. Putin deals with Deep State agendas as does Trump and his Junta. That Putin seems to be in a rush, the steps he is taking are so intertwined that to move slowly puts his cleanup at risk. Funds can be moved and hidden, papers can be destroyed, and witnesses can be eliminated. But when the purge is done simultaneously the rats are snared. Russian’s Central Bank is privately held, thus not under Putin’s control. 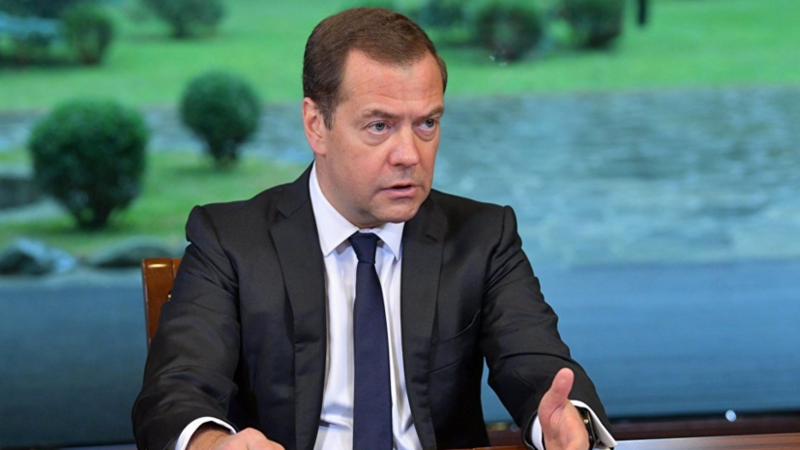 The attempts to destroy evidence by fire did not succeed, and a Medvedev double now compliant. Is there a reason that Merkel and Macron are suddenly embracing Putin warmly? The Soros agenda to gain control of Russia has failed. payment system, and establishing a Russian credit card, the MIR. The struggle of deputies that has been going on for almost two years against the independence of the Central Bank has moved to a decisive stage: in the near future the Duma should consider amendments to the Law on the Central Bank in the second reading. In Russia, Peresvet Bank had an edge no other big private financial institution could match. Its largest shareholder was the powerful Russian Orthodox Church. In a 2015 pitch to investors, Peresvet said the backing of the church and the bank’s other big owner, Russia’s Chamber of Commerce and Industry, gave it a “quasi-sovereign” status. For more than two decades, big state companies stashed their cash with the bank, whose ponderous full name—Joint Stock Commercial Bank for Charity and Spiritual Development of Fatherland—suggested its grand standing. Prices in Russia are rising at their slowest pace this year since the collapse of the Soviet Union. The first week of November saw inflation further slow. and gradually migrating its peoples there. Trump likewise is defending the US borders, and drawing the troops home. Funds to NATO and the G7 show this trend - no longer defending allies, but the home front. The weakened grip of the New World Order crowd shows. Even Europe is embracing Putin! Russian President Vladimir Putin danced arm-in-arm with Austria’s Foreign Minister Karin Kneissl at her wedding, after receiving an invitation that opposition critics said undermined the West’s stance against Moscow. and is now serving a life sentence at Gitmo, per the Zetas. But over in Syria, his buddies among the Syrian rebels and ISIS remnants were resentful. They had planned a celebration, but their party favors, a weapons depot at Idlib near Damascus, was blown up on September 1, on the Labor Day weekend in the US. Who did this? Certainly the Russians did not want Assad hassled and the US did not want a conflagration in Syria and the always nervous Israel could not be ruled out. But per the enigmatic Q, it was done by a “Magic Sword”. This newly discovered site, which appear to be a rack with a nearby entry to an underground port, is another launching site, which of course has a control booth nearby. Since it is not similar to mankind’s launching mechanisms, it is not recognized for what it is. This may be a new site for Internet aficionados but known to the establishment which has clearly visited to inspect. What is interpreted to be a crashed ship on the Scotia platelet near the tip of S America is not a crash at all but a routine port. The track marks are in fact rail lines used to tow a ship’s cargo to a nearby storage vault. resulted in the probe being shot down. They cannot shuttle to Earth at this time, as it has been deemed by the Council of Worlds to constitute interference with your free will because their interaction with humans sprang from their agenda for conquest. In times past, other rules were in place and interaction did occur. The quarantine was put into place some thousands of years ago, but close enough in your recent past that contact with these alien life forms remains in your legends. The Earth in their memory is full of carnivors, rebelling slaves, and accidents related to wild weather. In July 1988, the Russians launched two unmanned satellite probes - Phobos 1 and Phobos 2. The last transmission from Phobos 2 was a photograph of a gigantic cylindrical spaceship - a huge, approx, 20km long, 1.5km diameter cigar-shaped 'mother ship', that was photographed on 25 March 1989 hanging or parked next to the Martian moon Phobos by the Soviet unmanned probe Phobos 2. After that last frame was radio-transmitted back to Earth, the probe mysteriously disappeared; according to the Russians it was destroyed - possibly knocked out with an energy pulse beam. Eventually, after being quarantined from Earth, they learned how to create and maintain their own atmosphere in air tight chambers, and thus relocatable they have continued their mining operations within the Solar System, on this spot or that, and are here still. What occurs when one of NASA's probes drifts close to this moon? Monitoring equipment stationed on the surface of Phobos by these visitors alerts them to the approach of something other than space trash. Not wanting to be observed or to become the object of curiosity, the giant hominoids simply put the eye out of the probe. This is done with a laser, the same mechanism they use to send signals to one another at great distances but devastating to delicate electronic equipment at close range. Send a probe to Phobos and oops, the probe stops working! Any attempt to fly a manned shuttle to Phobos to explore the operation would also meet with disaster and death, and such an attempt is therefore ill advised.